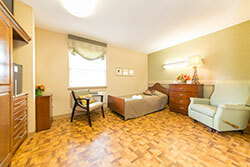 Salem Place Nursing and Rehabilitation pairs the comforts of home with modern conveniences. 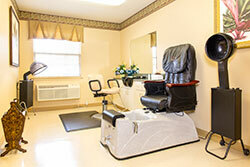 Our beauty salon, reading library, lush outdoor secured courtyards with a putting green, large projection TV screen and a spacious common area for visitation, are just a few of our facility features that set us apart from other nursing and rehab facilities. 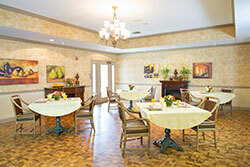 Our spacious indoor and outdoor visiting areas, comfortable sitting rooms, patios, and gazebo create a comfortable setting for residents and visiting guests. Dining is experienced in a relaxed and cheerful atmosphere. 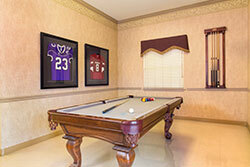 Private and semiprivate professionally decorated rooms give the face and feel of a 5 star hotel. Our daily services, including laundry, housekeeping, mail delivery, and transportation provide residents comfort and convenience. • Outside covered patio area. • Outside garden, wheelchair accessible. We provide daily planned activities like social events and outings and pastoral services with spiritual care for all religions. Family participation in group activities, meals and celebrating family birthdays and special days is welcomed and highly encouraged. We also provide a monthly event and meal calendar to make planning visits more convenient.